A Louis Swanson penalty ensured reigning East of Scotland League champions Lothian Thistle Hutchison Vale emerged with maximum points from their trip to Eyemouth United. 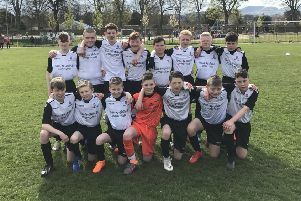 It was Raymond Carr’s men’s third victory in the space of a week as last Saturday’s win at Peebles Rovers was followed up with a midweek triumph at Preston Athletic. The Capital side are now up to third but remain 15 points adrift of current leaders Kelty Hearts. They do, however, have five games in hand. Lothian will now turn their attention to Wednesday night’s Football Nation Qualifying Cup semi-final clash with Lowland League side Vale of Leithen at Saughton Enclosure (kick-off 7.30pm). Meanwhile, second-placed Leith Athletic cruised to a 5-0 win over Stirling University at Peffermill. Kern Hutchison, Dan Garvey, Callum Mein and Ryan Currie were all on target for Steve Chalmers and Leighton Jones’ side with an own goal from a Stirling defender completing the rout. Tynecastle eased past bottom club Tweedmouth Rangers 6-1 at Saughton Enclosure, Robbie McIntyre, Craig O’Reilly and Niall Kelly all on target twice for the hosts. And, following a goalless first half at Hibs’ East Mains Training Ground, Heriot-Watt University ran out 3-1 winners against Ormiston. Anton Dowds netted a brace for the students with Cammie Ross also on the scoresheet.